Dynamo Kyiv is currently on a dream run in the Ukrainian League, leading the tables and seven points ahead of title holders and this year's UEFA Champions entrant FC Shakhtar Donetsk. Coach Serhiy Rebrov's emphasis on set pieces and strong counter-attacking has paid off. 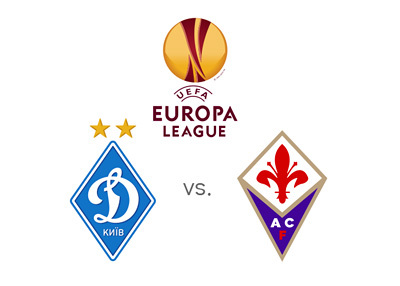 Although Dynamo Kyiv have scored as many as 22 goals from their 10 Europa League matches their ability to find opportunities against stronger opponents will be severely tested going into future games of the tournament. Fiorentina's 19-match spell in which they lost just one game catapulted them to a third position in the Serie A rankings, a place in semi-finals of the Coppa Italia and recently an entry into the last eight of the Europa League where they play Dynamo Kyiv at the Olympiyskiy National Sports Complex on April 16th. Unlike their Ukrainian opponents Fiorentina's recent domestic show left much to be desired. They blew away a 2-1 first leg lead in the Coppa Italia semi-final against Juventus, losing the 2nd leg 0-3 to exit the tournament. A 0-3 loss to Napoli in a Serie A saw them plummet to the 5th position in the League standings. Coach Vincenzo Montella's unconventional tactics have earned Fiorentina the nickname "Little Barcelona", but the 43 goals the Viola have scored from 29 Serie A games doesn't do justice to the umpteen number of scoring opportunities the team creates. Despite having scorers of the calibre of Mario Gomez and Mohamed Salah, their finishing needs some polish. With the American-born Giuseppe Rossi injured and question marks over Mario Lopez and Khouma Babacar's fitness, the onus of manning the forward positions could fall on the mercurial Salah. The Dynamo Kyiv defense seems shaky at the best and has a propensity to let in goals. Their lack of experience in this department could be brutally exploited by a club like Fiorentina who are always hungry for goals. Kyiv have conceded 11 from their 10 Europa matches this season resulting in three losses. Fiorentina are unbeaten in 11 European away games with 8 wins and 3 draws to their credit. They have never lost in the quarter-finals of a Europa Cup and are unbeaten in all the 11 matches they have played against Ukrainian sides till date. Dynamo Kyiv have managed to win just 2 of their 18 encounters with Italian clubs so far. Dynamo will miss out on the services of defender Yevhen Makarenko and midfielder Miguel Veloso on account of injuries while for Fiorentina, Argentine defender Jose Maria Basanta is out on suspension going into Thursday night's clash. Despite the Viola's great track record against Ukrainian sides, they will be playing at the Olympiyskiy stadium in a pressure-cooker environment with crowds in excess of 60,000 expected to turn up what with the spectre of violence looming large. The arena was a scene of fan violence in a Round of 32 clash against French club Guingamp in February this year. Despite their dismal history against Italian sides, bookmakers are wagering on a Kyiv win. The 1st leg clash on Thursday promises to be a exciting and turbulent affair.